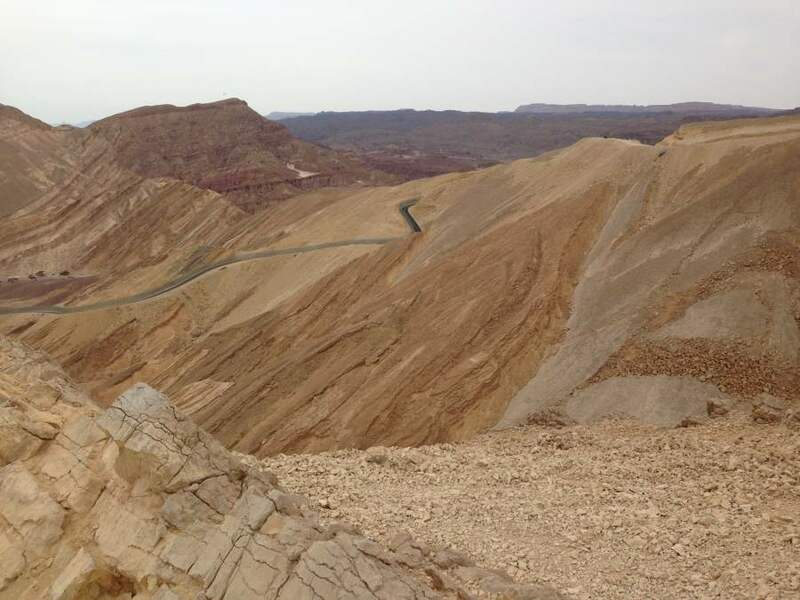 This is the first leg of a 60km trek that winds through the Eilat mountains from the Red Sea to Park Timna. It is one of the most visually stunning parts of the Israel National Trail. 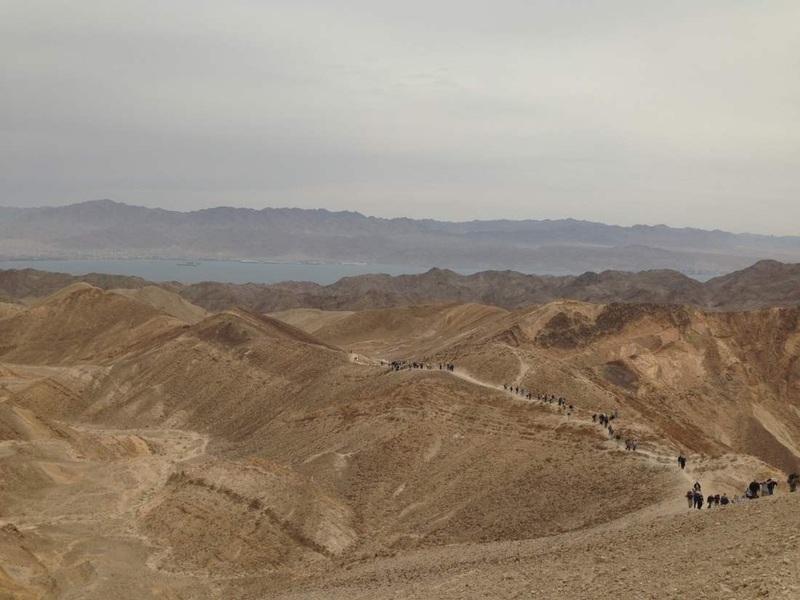 I have hiked in many exotic places and kept thinking that walking the trails of the Eilat mountains rivals any of the best hiking routes in the world. The route that we took is a variant of the INT. We had joined in with a group of about 200 people and rather than take the shvil up to Highway 12 near Har Yoash (הר יואש) at the 14km mark, our route turned east from the INT at the green trail 20562 and then north on black trail 20561 to end the day at a camp site on the south side of Highway 12. Here you can spend the night in your tent or take a quick cab ride to Eilat. The night before our hike we stayed at the 'C Hotel' which was initially hard to find even with Waze but is actually very centrally located. It is clean, and well kept and includes a really nice breakfast buffet. Breakfast only opens at 7am but you can make arrangements at the front desk to get in a bit earlier and pack up a lunch. The price we paid per night in February was $79 for a room that accommodated three of us comfortably with double and single beds. In terms of carbing up before of after a hike near Eilat, I recommend Il Pentolino - we went there twice in three days. They serve really delicious pasta, pizzas and fish. The place has great atmosphere and friendly staff. We started at the field school located on Highway 90 at Almog beach. It is fairly easy to find using Waze. The trail took us quite close to the Egyptian border and at several places one can see the border fence. 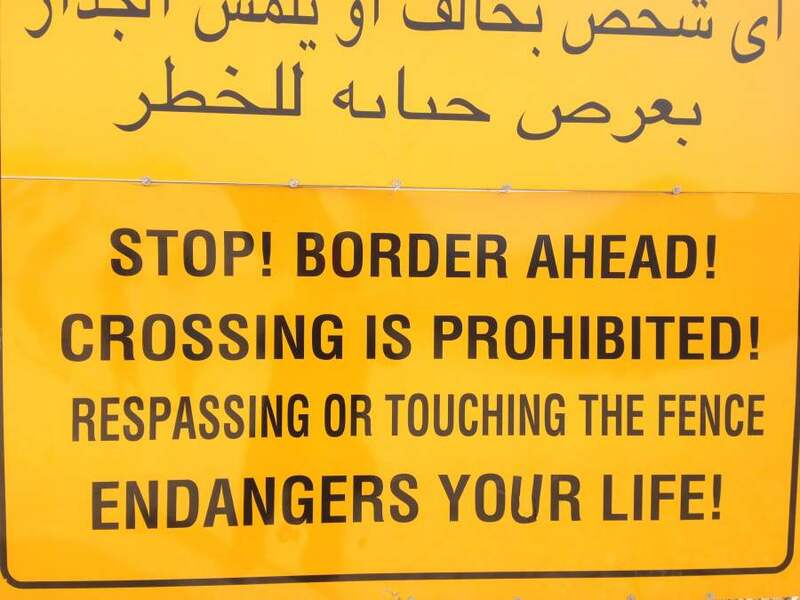 Until recently there was no security barrier - only a flimsy fence easily crossed by smugglers and refugees from Africa. A terror attack launched by murderous Jihadist terrorists in 2011 forced the Israeli government to spend approximately $400 million constructing hundreds of kilometers of high security fence and military access roads. The man in the foreground of the photo below was one of my heroes on the trail. He is 70 years old, has completed the the Israel Trail twice from both directions and began a multi-continent trekking hobby at the age of 58. After one of his daughters returned from her post-army trip to South America he was inspired to do the same. He has walked and rafted some of the most challenging routes in South America, hiked from Ethipia to South Africa and was about to start a solo seven month camping trip to New Zealand.